On the opening day of the 52nd Congressional Cup, stage two of the World Match Racing Tour, 12 of the world’s top ranked skippers scrapped on the waters off the Belmont Veterans Memorial Pier. Nothing was predictable about today. Not the wind direction, nor velocity, nor the outcomes. Johnie Berntsson, primed after three days of racing at the Ficker Cup Presented by Porsche, chased Keith Swinton’s tail in a masterful pre-start tacking duel that had spectators on their toes, in awe. Berntsson won that dog-eat-dog match, finishing the day 3-2. Reining World Champion Ian Williams’ bark was seemingly worse than his bite, as he wrapped up 0-5; while Nicolai Sehested, racing in his first Congressional Cup, was the alpha dog of the day: undefeated at 5-0. Waka Racing’s Phil Robertson was nipping at his ankles, at 4-1, despite ‘shooting the dog’ (shooting a vile alcoholic beverage garnished with a Vienna sausage, at “Dogs” bar in Long Beach). Chris Steele finished 4-1 also. The day began with 6 to 8 knots from the southwest providing classic Long Beach conditions. Four flights of Qualifying were pulled off smartly, until a sudden wind shift that put racers practically on the beach. After a lengthy postponement the wind shifted right again, and built: to a stunning 20 plus knots that spread white caps across the bay, and threw green water over the bows of the Catalina 37s. Despite the ‘ruff’ conditions, Sally Barkow and her all-girl crew accomplished their first and only win of the day, against Ian Williams – proving they have no problem playing with the big dogs. 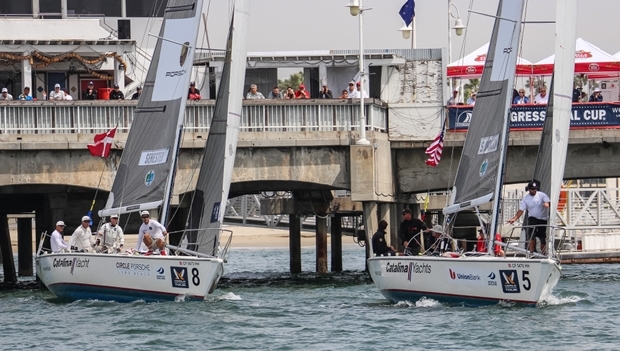 Congressional Cup, hosted by Long Beach Yacht Club, continues through Sunday April 10. The top four after Qualifying will advance to Quarter Finals, while competitors ranked five to 12 will sail repechage from which the first four will advance. Racing takes place daily beginning at approximately 1130 directly off the Belmont Veterans Memorial Pier, where spectators can watch world class yacht racing for free. Live commentary explains the ins and outs of match racing and tactics, while viewers also enjoy music and entertainment, refreshments, shaded bleachers, and an enthusiastic crowd of fellow boaters.